Greetings to all those out there! There are a lot of things coming our way this year. Some things will look the same. While others will change drastically. Let’s get something out of the way at the start- Rest assured I am here for the long haul. Not sure what I am working on or what role- but I am not going anywhere. Now then-Chaos March. We designed this thing to last about a year-but what that was back in 2015! It has been the awesome response from the community that has kept us going much longer. But I have an eye for the future-it is the future anyhow! So we are at a beginning-figuring out what comes next once the starmap is conquered. Don’t worry-there are still plenty of planets to fight for first-have a look yourselves- Map – but we are making such rapid progress that planning has to begin. But our team is worldwide- literally! – it is hard to hold monstrous multi-hour long meetings on teamspeak. It is just not efficient. There are countless things to discuss and plan before a direction is even decided upon. So-after a few crazy busy weeks of testing forum packages-the decision was made to settle on Discourse. The features it brings should enable the team to be able to communicate well on a schedule that works for each contributor. Check it out- here – the blog and Discord have some integration with the forum. Ultimately, our outstanding goal from 2017 was to centralize and publicize information regarding the event. 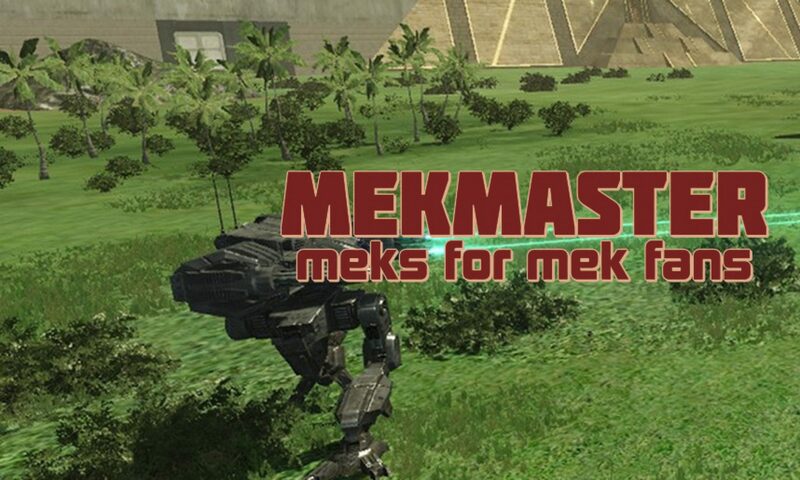 Information was spread across the teamspeak – (mwll.mekmaster.com) – discords – wiki – forums – reddit – youtube – steam community – google+ – the website – and man other places. The age of the event works against much of the now outdated information available on the web. Players were unable to easily follow the progress and outcomes of battles. 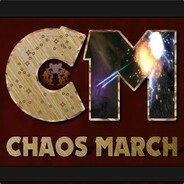 Hopefully the new site and forums can improve the experience of veteran and rookie pilots trying to track both Chaos March and the other ongoing events. Each post on the blog sends out notifications via a number of methods – browser notifications, rss, discord, discourse. The forum can send out these as well as possibly support push notifications. The idea is to support getting information to pilots that want it via the methods that work best for their situation. Work continues on advertising the event – we have recorded two update segments for the new MWLL podcast “Returning to Base” – check out episode 1 here . Episode 2 is in the works – be sure to check it out, the hosts – Warlord Kentax and Domkek have a lot of great content. Don’t forget our awesome video team! Ever notice that great video at the top of the page – check it out and the other promo videos Marius had directed. The first big step to take is to finish centralizing all this information. The battelog – the record of every campaign fought in the event – remains at the old forum -which is getting shut down at some point. That is why it was mirrored here . That actually led to the new forum work – we used the old official forums for most of our communication. New official forums are coming-the event will have a presence there- but the event planning will need its own place. Yes-I am going to need help setting up, organizing, and copying over that old information to the new forum. The blog needs more posts – trust me I love to write – but it is a long process to create a good post. Seeking volunteers-primarily to collect and post the post-battle information after the weekends finish. Oh and yes could use some artwork – cause its pretty dark around here! It has been a few years, 2014-I feel old-since we did any kind of header, badge, or other graphics that we can plaster everywhere. This is three years old now, the old poster – which is awesome – but 16:00 UTC is a bit early to be waking up! I am working on putting some polish into the videos. They will always be rough-meant to be the raw battle-but there is room for editing and production values. Mainly showing what mechs were taken into battle, the pilots, the result of the battle- ie what changed on the map, what are the effects of the outcome- some graphics and just maybe more of this ! The Chaos Event Council and I are going to meet shortly to begin the long work ahead of us – both for now and the future – to ensure 2018 is as fun – and hopefully better – than an awesome 2017. Now go back to what ever all the pilots do during the week and come back this weekend returning to Chaos! Come take a look . Content is slowly being added. Chaos resumes Saturday. The drop calcs are all filled out ready for action. Sunday we are still setting up but should be ready as well. 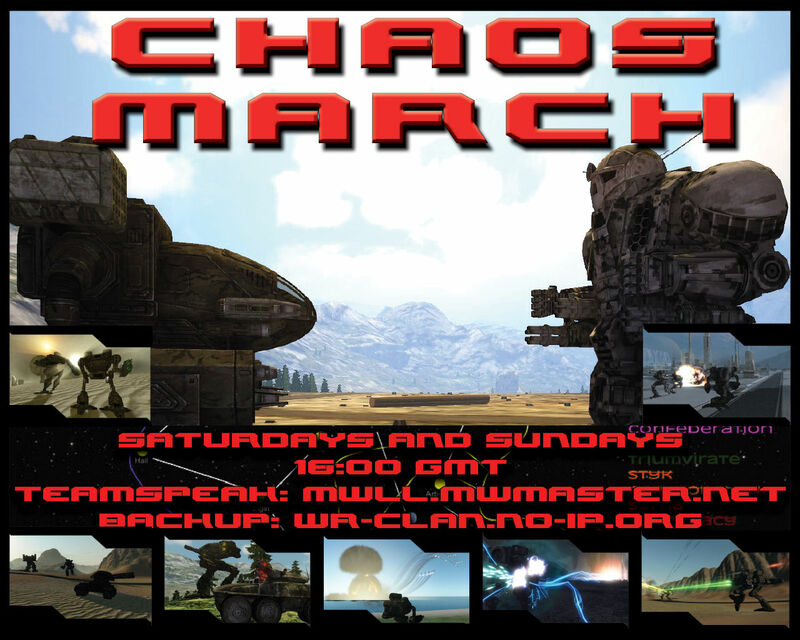 Note, this is the last full weekend of Chaos March for the next 3 weeks. Note we are taking this Friday off! Check out this crazy action from Tuuz’ on TSA Northwind. If you need youtube then your video is TSA Harvest. Publicity! I was part of the initial recording of MWLL: Returning to Base radio broadcast this past Friday. Check it out for some neat stuff. I start talking at 29:10 about events and upcoming stuffs. Thanks to Warlord Kentax and Domkek for the interview.